Also known as What the heck do we do now I’m tired of Go Fish! Alternately known as Move over Candyland…The Pirates are Coming! As a speech therapist working in the schools I look for new games whenever I can. When I find a new game that looks like fun and is easily adaptable for both articulation and language therapy, I do a happy dance. When the game is affordable I do the REALLY happy dance (and trust me, you do NOT want to know what that looks like!). When that game is made by a couple of SLPs specifically for the purpose of speech therapy, I am beyond excited. Imagine my pleasure when I met Dean and Leah of 2Gals via twitter. Dean is a retired SLP while Leah is still practicing. Their blog is a great source of real therapy help. Having trouble figuring out how to elicit a sound? Most likely there is a post about it. What’s really great about the blog is that it’s real…they know what it’s like working in the schools because they’ve done it. Now, as you most likely know, I work with ages 3-21. As such, my games are very scattered. I play Uno with the older kids, Candyland and Memory with the little kids, and everything in between. I don’t know about the kids, but I’m honest enough to say that playing the same game day in and day out is a bit … monotonous. Granted, the kids only play it once a week – but I play it oh 20-30 times a week…sometimes as many as 10 times a day. Now, granted Candyland is a great game…but come on there’s only so many times you can play it without yawning! When I discovered that 2Gals also sold therapy products, I was pleased. I was very happy to purchase a few of their games (after all, we need to support each other, right)? I have to say now my 2Gals games are my go-to games these days. I was very pleased the games are priced so that I could purchase them with my own money. Now I know they can come with me where ever I work! What’s really great is there is a wide variety of games to choose from. They are fairly simple games, not a lot of rules, and easily adaptable to both articulation and language. Kids from all ages and most abilities are able to play the games with just a bit of adapting. Working on basic concepts or reading – check out Looting Pirates. Working on that pesky /r/? Nothing better than Gold Rush… Let me show you what I mean. Looting pirates is one of the favorite games for the kids. It’s a great way to teach kids basic concepts such as: Left, right, next to, beside, across, skip, one, two, three, all, some, none, few, couple, pair, few, least, girl/boy, most, each, and every. The game comes with the bag, 50 coins, and direction cards. The players either give or take coins based on the directions of the card. What’s awesome about this game is it doesn’t have to be just about basic concepts. The game can be a great target for following directions, turn-taking, pragmatics, math concepts, and articulation generalization…You can also use it for reading ability since the kids have to read words. It’s a fun, tangible way to teach concepts – and the best part is the kids don’t even know they are learning. 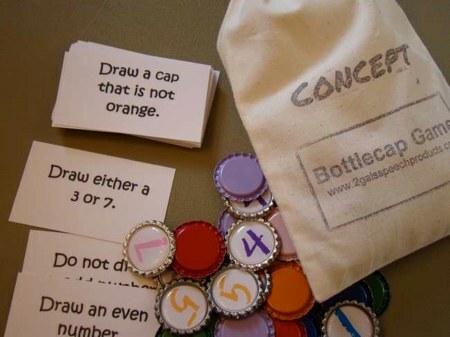 For concepts that are a bit older (it includes negation) I love to use the Concepts Bottle Caps game. Linguistic/Math not, odd, even, more than, less than, either, or, neither nor, any but not. See what I mean? 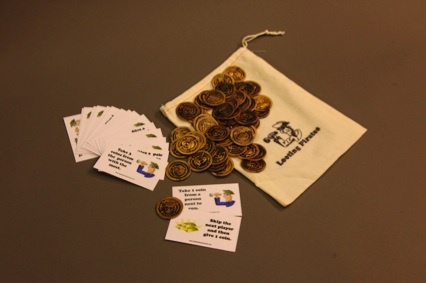 While I use looting pirate concepts for those lower functioning or young students, the bottle cap game is great for those older elementary students. The only downside at all to this game is that the caps are awfully fun to stack, clink, and distract. But, with a few gentle reminders this is easily taken care of. Obviously the games are fun. They target a multitude of activities and therapy needs and the kids love them. But, that’s not all that 2Gals has to offer. In addition to their fabulous games, they were a godsend to my homework practice this past year. As I said earlier, I hate artic drill work. I still do it, but I try to make it as much fun as possible. I can’t tell you the number of times I’ve spent weeks cutting out boardmaker pictures and gluing them to index cards to create card games (memory, go fish). When I discovered 2Gals FAME (Fun, Affordable, Motivating, Effective) Articulation Cards and Workbooks on CD I was ecstatic. The articulation cards allow the SLP to print out cards to create card decks. Now it’s easy to send card decks home and ask parents to play a card game with their student. Homework actually gets done on occasion. Amazing! The workbook CDs are an easy way to create homework pages. They have targets for most phonemes between the Preschool FAME and Articulation FAME. Preschool targets those early developing sounds (M, P, B, T, D, N, W, H, Y) where the Articulation CDs target CH, F, G, K, L, R, S, SH, TH, and V. The workbook features pages and the skills progress (words, phrases, sentences), fill in the blank, etc. As you probably know from my previous posts, I’m a bit particular when it comes to word choices. I do have to tweak the words a bit for some of my phono kids – but no more so than I would the Jumbo book of Articulation or an articulation app. I didn’t get paid to write this post…I didn’t even get asked to write this post. But, I firmly believe in people helping people. The fact that these products were developed by SLPs for SLPs intrigued me…but if the products weren’t good, I certainly wouldn’t be talking about them here. The fact that my students LOVE when I get the bags of games out is testimonial that they work. I’d dearly love to see more products by these two ladies. If you have any 2Gals products – drop me a line here. Let me know which ones you have and why you like (or don’t like) them. I’d love to hear! Thank you Mary! What an enthusiastic post about our games. There is truth in every word or therapy materials are GREAT! …and yes, we create products that we need (or needed in my case) in our own therapy! Thanks for letting others know about us. It is deeply appreciated. If you haven’t discovered http://www.lessonpix.com\soundfinder then check it out. It is FREE and fabulous for making sound sheets for homework and therapy activities. No – I am not associated with them – just another SLP looking for helpful sites to make life easier 🙂 Thanks for all your posts. I love your gems of speechie wisdom. Regards, Suzanne. LessonPix is wonderful. Bill from there has actually helped me out here on the blog a bit. 🙂 I actually have another post to talk about Lesson Pix. I’m just waiting for the other posts and giveaways that have been staring Lesson Pix to die down a bit. What’s great about the FAME CD is it works for those (ahem..rare) moments when I forgot to get the homework ready and need to print something out in the few minutes between kids. Thanks for the compliment on the blog. It’s great to hear that you find it helpful (or at least mildly entertaining).